Protests Disrupt Pipelines Across The Northern U.S. : The Two-Way On Tuesday, activists targeted five pipelines carrying crude oil into the U.S. from Canada, as construction resumed on a North Dakota pipeline. 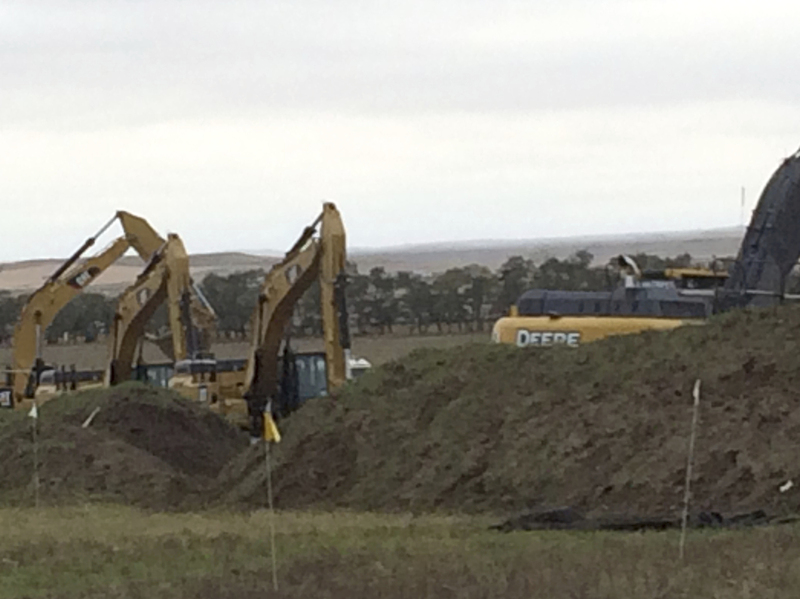 Work resumed Tuesday on the Dakota Access Pipeline, near St. Anthony, N.D. The fight over transporting crude oil has spread across the northern U.S., with protesters disrupting pipelines that carry crude from Canada into the U.S. At least one protester has been injured and dozens have been arrested since Monday. The unrest, in communities from Minnesota to Washington state, is connected in each case to the ongoing battle over an oil pipeline under construction in North Dakota. Since it was approved by the U.S. Army Corps of Engineers over the summer, more than a thousand people have protested against the Dakota Access Pipeline — specifically the portion that is slated to run under a river near the Standing Rock Sioux Reservation in North Dakota. The Standing Rock Sioux Tribe opposes the pipeline because they say the route crosses sacred sites and burial places, and they are concerned that if the pipeline ruptures, an oil spill could pollute drinking water. Construction had temporarily halted while the courts reviewed the tribe's complaints, but on Sunday a federal appeals court paved the way for building to resume. That was when two days of clashes began. On Monday morning, the company building the Dakota Access Pipeline, Energy Transfer Partners, went ahead with construction despite a joint statement from the U.S. Departments of Justice, Army and Interior requesting that they voluntarily pause until the Corps finishes its review of the pipeline's entire route. 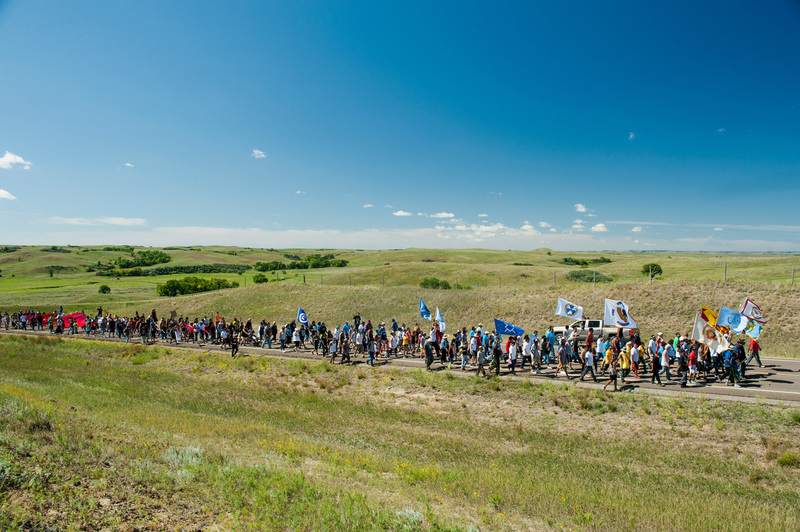 Protesters march to a construction site for the Dakota Access Pipeline in September. That day, 27 people near the Standing Rock Sioux Reservation were arrested for what the local sheriff called a "riot," according to The Bismarck Tribune. Meanwhile, a Columbus Day protest in Reno, Nev., turned dangerous when a pickup truck barreled through a crowd of people demonstrating for Native American land rights, hurting several people and seriously injuring one woman, according to the Reno Gazette-Journal. Audio from the scene appeared to capture the pickup truck revving its engine before accelerating into a crosswalk. The Reno Police Department told the newspaper it is investigating the incident and that the driver had not been arrested. Then, on Tuesday, a group acting in support of Dakota Access Pipeline protesters carried out a coordinated protest that briefly shut down five pipelines that move crude oil into the U.S. from Canada. The group Climate Disobedience Action Fund said on their website that a total of nine people affiliated with the group were arrested for tampering with two pipelines in Minnesota, and three others in Washington state, North Dakota and Montana. The two Minnesota pipelines are run by the energy company Enbridge, which took to Twitter to condemn the protests as dangerous. "We are aware of tampering that occurred on our infrastructure this morning – this action is incredibly dangerous and reckless," the company tweeted. "Those involved claim to be protecting the environment, but their actions invite environmental incident and create a safety risk." In Washington state, a spokesman for the Trans Mountain pipeline, Ali Hounsell, confirmed by email that three people were arrested after tampering with the Puget Sound portion of that pipeline. The company echoed the concerns of other companies, calling the protesters "reckless." A spokesman for the company's Canadian operation told NPR the pipeline was not operating at the time, but that a line that feeds into the affected area was shut down as a precaution until the section could be inspected. A spokesperson for Spectra Energy also confirmed a section of the company's Express pipeline in Montana had been shut down on Tuesday after people tampered with a valve. The Association of Oil Pipe Lines, a trade group, released a statement calling for activists to "end their forms of dangerous protest," and warning that "incorrectly closing a valve in the middle of a pipeline ... could cause a pressure surge, rupture the pipeline and cause a spill."